【Application】 Gravel field, mine, building materials, transportation, chemical, water conservancy and hydropower, concrete mixing station, etc. 【Description】 The Spiral sand washing plant is a kind of sand washing machine, which is divided into two kinds: the single screw sand washing machine and the double screw sand washing machine. The sand washing process is very important in the mining industry, Spiral sand washing machine as common open-pit mining equipment, is suitable for washing, classifying and removing impurities in metallurgy, building materials, water and electricity industries. 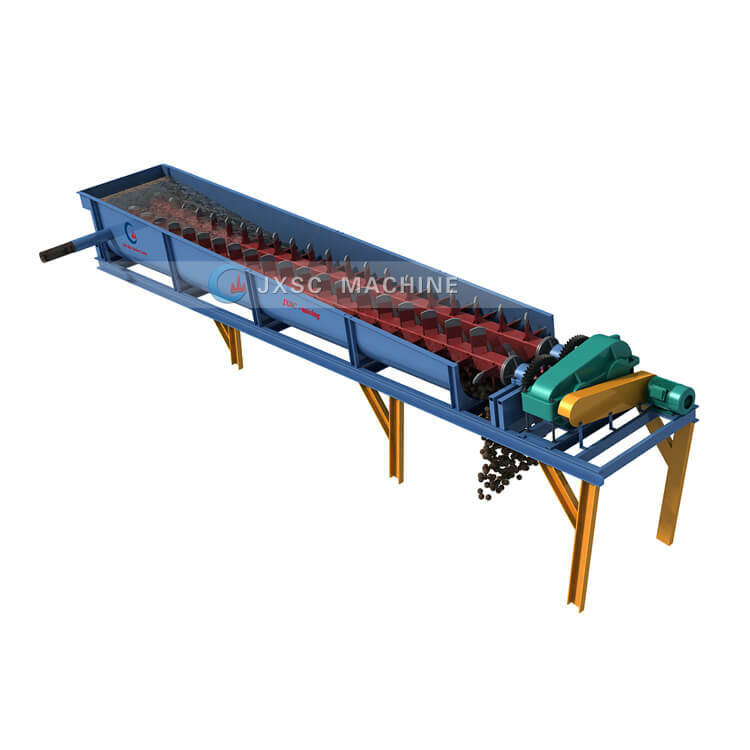 It is used for washing and selecting fine-grained and coarse-grained materials. It is also suitable for building sand and road-building sand. Spiral Sand separator power consumption is small, high cleaning degree. With the good sealing structure, fully closed transmission device and adjustable Weir Plate, the product features high efficiency, durability, good cleaning, dewatering effect and fine product stability. Spiral sand washing machine structure is reasonable, convenient maintenance, processing capacity, small power consumption, high cleaning degree. The novel sealing structure of spiral stone washing machine, fully sealed oil bath transmission device and adjustable overflow Weir plate ensure the series of products high efficiency, durable, good cleaning, dewatering effect, fine products keep in order and so on. The spiral washing machine is widely used in the washing of all kinds of easy washing and hard washing ores. In more than 20% clay mine can make block crusher and chute, the spiral washer can make the clay more than 20% of the ore washing spiral stirring, scrubbing and mud to separate the ore, washed ore discharged from the output side, water discharged from the tailing end. 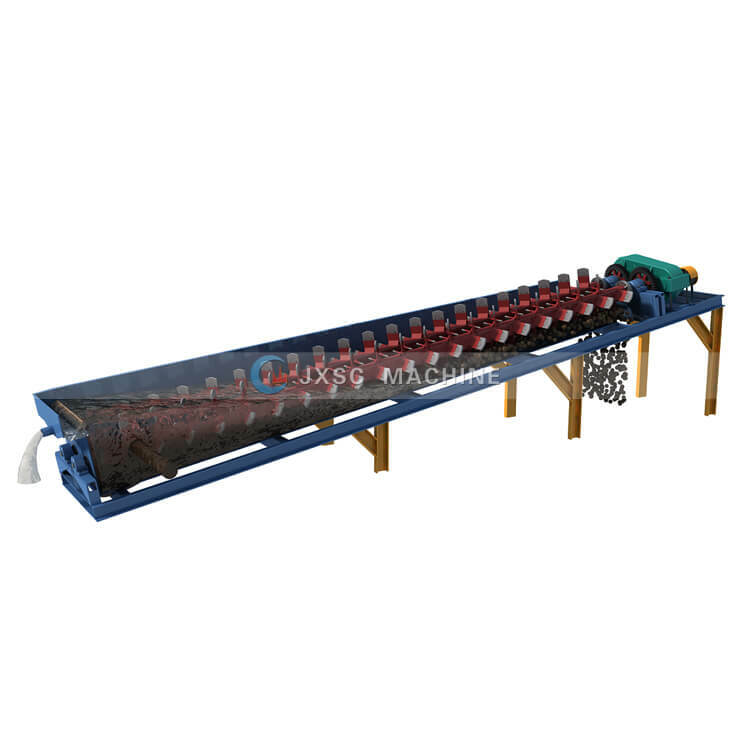 The equipment is combined with the scrubber washing machine and is relatively effective for hard washing mine. JXSC provide sand washing machine design service, small sand washing machine, bucket wheel sand washer, sand washing plant, gold trommel are available. 【Work Principle of Spiral Sand Washing Plant】Spiral washer is large equipment for black and non-ferrous metallurgy mines, iron and steel, metallurgy, chemical industry and building materials to wash ores and stones. The washing machine has great processing capacity, which is ideal equipment to meet the requirements of large productivity for the cleanliness of ores and stones. 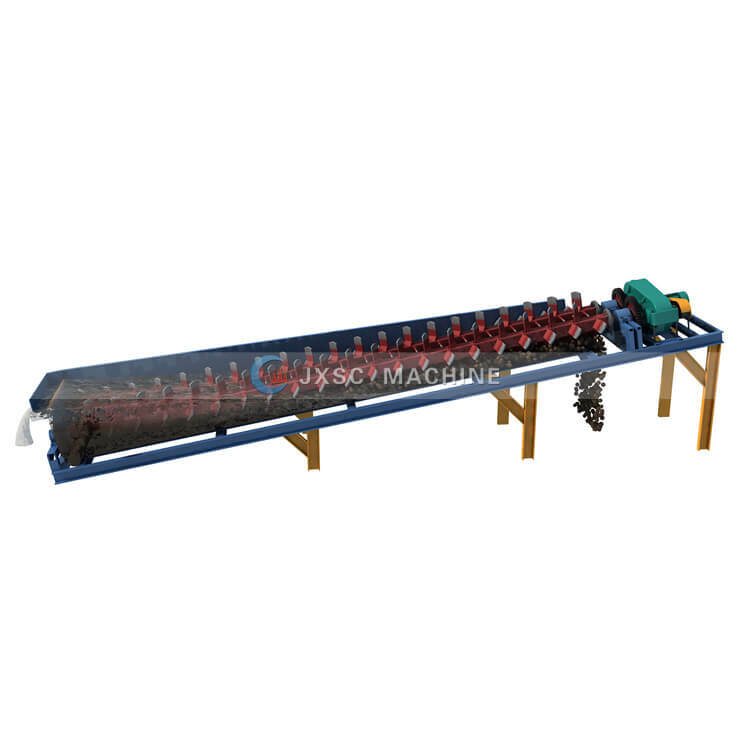 Washing first can avoid the crusher and screen machine blocking, In the raw materials, such as soluble or harmful ingredients, should also be washed. The washing machine is widely used in mines, coal, smelting, and other industries. 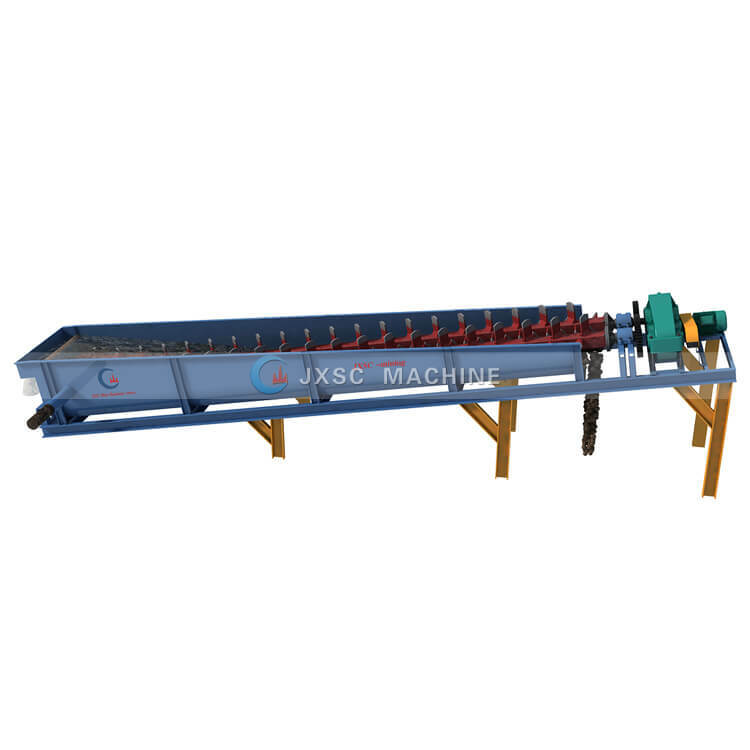 The sand and stone materials are stirred by the screw device in the sand cleaning machine so that the soil and water in the sand and stone materials are mixed. From the flow of the sand washing equipment, and sand and gravel under the role of the spiral device are gradually screened from the top of the discharge port discharge, thus achieving the sand and gravel cleaning screening effect.